Businesses with strong cash-flow are rightfully held in high esteem as investments. Google and Apple are good examples. Betting/gambling firms and insurers (in non-stressed loss periods) are other examples of businesses, if properly run, that can operate with high positive cash-flow. The banking sector is at a completely different end of the spectrum as liquidity transformation is essentially the business. Everybody knows of Lehman Brothers bankruptcy, which was instigated in late 2008 by an immediate need to find $3 billion of cash to meet its obligations. The winding-up of the Lehman Brothers holding company in the US is estimated to return approximately 26 cents on the dollar according to this FT article. It was therefore a surprise to read in the FT article and in another recent article on the expected surplus of £6 to £7 billion from the winding up of Lehman Brothers operation in London after all of the ordinary creditors have been repaid in full. This outcome is particularly surprising as I understood that the US operation of Lehman did a cash sweep across the group, including London, just prior to entering bankruptcy. In his book (as referenced in this post), Martin Wolf highlights the changing perceptions of value since the crisis by using ABX indices from Markit which represent a standardized basket of home equity asset backed securities. 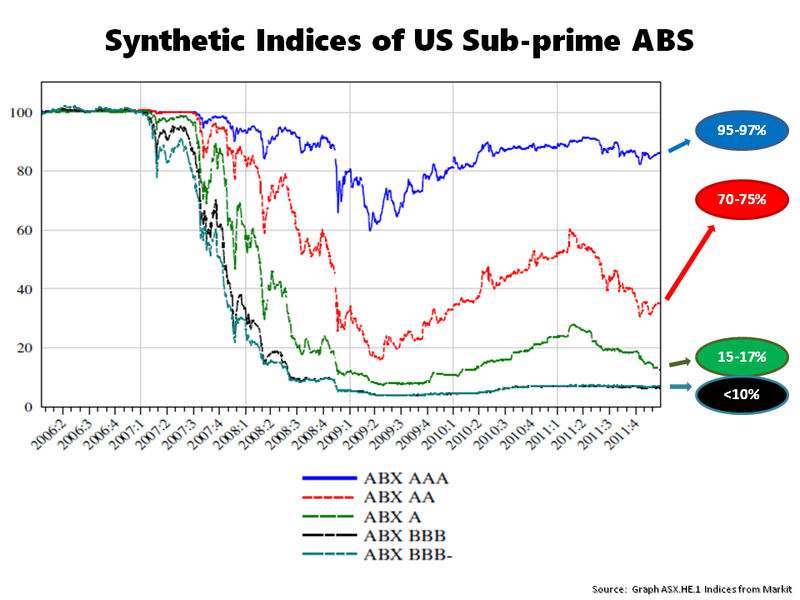 The graph below shows the value for one such index, the ABX.HE.1, to the end of 2011. These indices are infamous as they were commonly used to value securities since the crisis when confidence collapsed and can be used to demonstrate the perils of mark to market/model accounting (or more accurately referred to as mark to myth values!). I have included the more recent values of similar ABX indices in the bubbles as at last year from Wolf’s book. This graph accentuates the oft used quote from Keynes that “the market can remain irrational longer than you can remain solvent”. Wolf argues that the 3% liquidity ratio proposed under Basel III or indeed the 5% proposed in the UK are totally inadequate and he suggests a liquidity ratio closer to 10%. On capital ratios, Wolf argues for capital ratios of 20% and above with a strong emphasis on tier 1 type equity or bail-inable debt that automatically converts. This contrasts against the 6% and 2.5% of tier 1 and 2 capital proposed respectively under Basel III (plus a countercyclical and G-SIFI buffer of up to 5%). Wolf also highlights the bankers ability to game the risk weighted asset rules and suggests that simple capital ratios based upon all assets are simpler and cleaner. Wolf supports his arguments with research by Bank of England staffers like David Miles1 and Andrew Haldane2 and references a 2013 book3 from Admati and Hellwing on the banking sector. Critics of higher liquidity and capital ratios point to the damage that high ratios could do to business lending, despite the relatively low level of business lending that made up the inflated financing sector prior to the crisis. It also ignores, well, the enormous cost of the bailing out failed banks for many tax payers! For me, it strengthens the important of liquidity profiles in investing. It also reinforces a growing suspicion that the response to the crisis is trying to fix a financial system that is fundamentally broken.